Almost everyone has their own Ishta or favored Deity, this is the deity that they prefer the most and identity with and pray to whenever they are in trouble or are facing some or the other problem, obstacle or worry. In this post, I will explain the simple method of making the worship of the Ishta Devta more effective and result oriented. 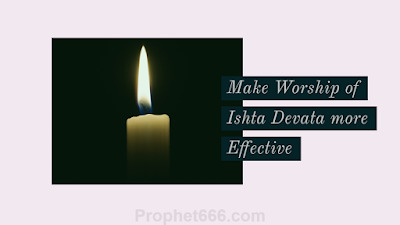 If you desire to make your Bhakti more fruitful and get results quickly, then, you can adapt the simple points given below by me into the regular worship of your Ishta Devta. 1] Never underestimate the power of the Ishta Devta or confine the power of your Ishta Devta to some per-set mental notion or belief or attribute him or her with a specific set of powers. This makes the Ishta Devta ineffective and less powerful. 2] Visualize your Ishta Devta as the Supreme Being, someone who is all powerful, all knowing and omnipresent and whose power is unimaginable and encompasses the entire Universe and is present inside every portion of the Universe, no matter how insignificant or small. 3] Never make the mistake of visualizing your Ishta Devta as being second or subordinate to some other God or Goddess. This is the mistake, which is made even by many advanced Sadhaks, for example devotees of Hanuman make the mistake of visualizing him as being subordinate to Shri Ram or devotees of Parvati or Lakshmi, often make the mistake of visualizing them as mere Shaktis or Consorts of Shiva or Vishnu. The same is true of many Ganesh Bhakts who visualize him as the son of Shiva. 4] Making the Ishta Devta subordinate to some other deity, reduces the power of the Ishta Devta in helping you and answering your prayers. It confines the All-Powerful Ishta Devta to a specific role. 5] Never go by the opinion or writings of other people, including great Swamis, Yogis or founders of some sects, who had visualized and preached that their Ishta Devta was above everything else in Creation and the rest were secondary or subordinate powers. It is their Bhakti towards their own Ishta Devta, which gave them the desired results, however, there is no rule, which states that what is applicable to one person is automatically applicable to everyone. 6] Never doubt the power of your Ishta Devta and concentrate all your energies single-mindlessly in his or her direction, diverting your energies toward numerous deities, will not give the desired results. Self-Doubts or fear is lack of energy and no Sadhana or worship will be successful, if there is fear or self-doubt. The points mentioned above should be very helpful for the followers of Davita who believe that the world and God are real and not just an illusion. Most Indians follow the Davita way of life or form of worship. However, Bhakti is present in both these schools of thought. This simple points mentioned are based upon some very important scientific facts, which, I will be writing about in the near future in other posts. And how about de temporary mantra prayogs? Regarding Hanuman, He always consider himself Rama bhathaka. He clearly said in one Prasannam,He always protect who worshiping Lord Rama. It's not.. here is a simple math .. if you worshiping Hanuman he only will help yours not for your entire family.. likewise.. all knows he a ram bhaktã but chanting of him only will make him happier. My Ishta devtas are shiva and Hanuman. I pray to them regularly wholeheartedly. Even in India in Hinduism our parents have taught to pray each and every diety. And celebrate diefferent deity festivals. We also go to different diety temples and pray to them . I cannot understand this post completely 😔. It’s similar to monotheistic religions.